Texture mapping is an important technique to add visual detail to geometric models. 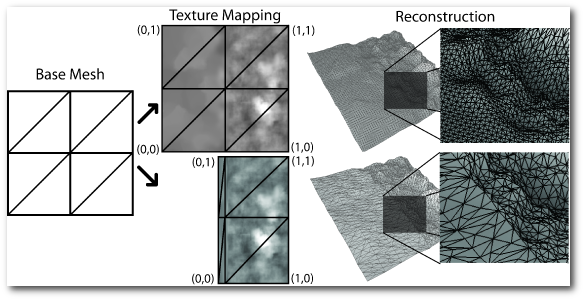 As an alternative to traditional image-based texture mapping, procedural textures are described by a function, with interesting properties such as compact representation, resolution independency and parametric adjustment of the visual appearance. Procedural textures are usually defined in the 2D texture space, making the result dependent on texture mapping coordinates assigned to the model, or in the 3D object space, implying in no correlation with the surface model. 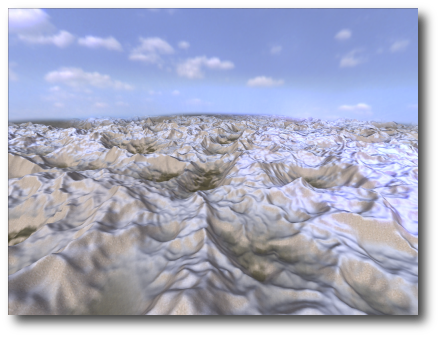 In this work we introduce GeoTextures, an approach that uses the geodesic distance, defined from multiple sources over the model, as a parameter that is taken into account by time-varying procedural textures. The use of geodesic distances allows the process to be both independent from the mapping of texturing coordinates and also conforming with the model surface. We validate the proposal by applying real-time procedural textures in complex surfaces. Path planning is an active topic in the literature, and efficient navigation over non-planar surfaces is an open research question. In this work we present a novel technique for navigation of multiple agents over arbitrary triangular domains. The proposed solution uses a fast hierarchical computation of geodesic distances over triangular meshes to allow interactive frame rates, and a GPU-based collision avoidance technique to guide individual agents. 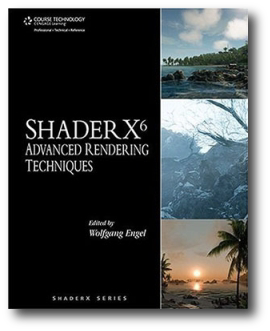 Unlike most previous work, the method imposes no limitations on the surface over which the agents are moving, and can naturally deal with non-planar meshes of arbitrary genus and curvature. Moreover, the implementation is a hybrid CPU/GPU algorithm that explores the current trend of increasing the number of CPU cores and GPU programmability. This approach exploits the best qualities in each processor, thus achieving very high performance. 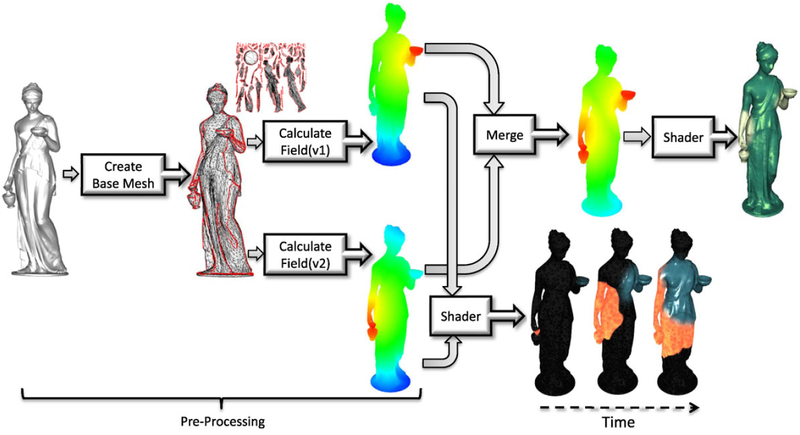 There is a vast number of applications that require distance field computation over triangular meshes. State-of-theart algorithms have quadratic or sub-quadratic worst-case complexity, making them impractical for interactive applications. While most of the research on this subject has been focused on reducing the computation complexity of the algorithms, in this work we propose an approximate algorithm that achieves similar results working in lower resolutions of the input meshes. The creation of lower resolution meshes is the essence of our proposal. The idea is to identify regions on the input mesh that can be unfolded into planar regions with minimal area distortion (i.e. quasi-developable charts). Once charts are computed, their interior is re-triangulated to reduce the number of triangles, which results in a collection of simplified charts that we call a base mesh. 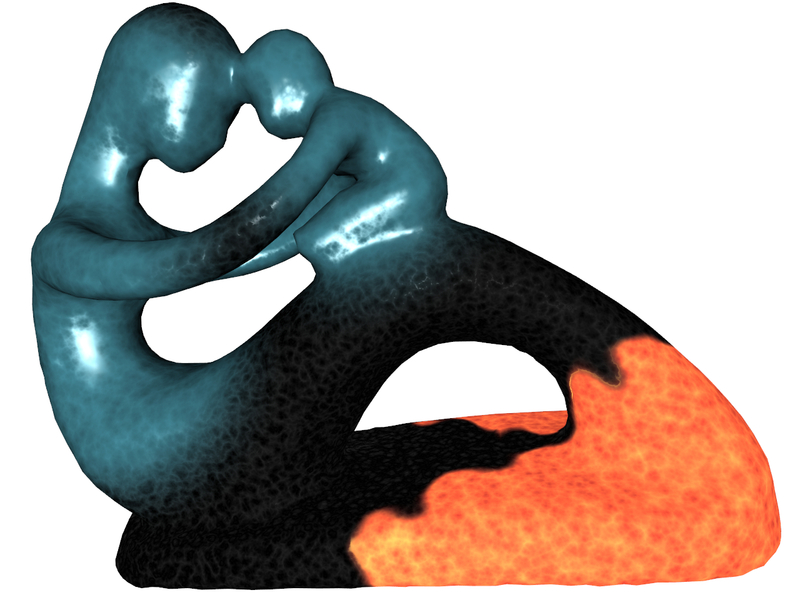 Due to the properties of quasi-developable regions, we are able to compute distance fields over the base mesh instead of over the input mesh. This reduces the memory footprint and data processed for distance computations, which is the bottleneck of these algorithms. We present results that are one order of magnitude faster than current exact solutions, with low approximation errors. 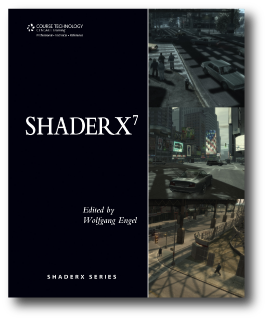 In: SHADERX 7 (Book Chapter), 2009. In: Simpósio Brasileiro de Jogos para Computador e Entretenimento Digital, SBGames, Brazil, 2007. Modern computer games often explore graphics quality while leaving interaction and gameplay behind. Arcade machines may improve gamer experience by using special devices (instead of traditional joysticks) to interact with the game. We propose a technique for 3D “point-and-click” interaction that separates both camera and pointer control. It also explores audio and visual collision detection feedback to improve user spatial sense. The experiments were done within a virtual 3D environment, similar to that used in first person shooter games (FPS), a genre popular and well known by both the entertainment industry and gamers. It can also be used in applications other than games, to perform tasks such as “drag-and-dropping” objects, drawing and selecting in general. The results were compared with the traditional FPS interaction technique (mouse-driven camera with point-and-click interaction).